Our five days in Los Angeles had gone by in a flash. Fortunately, we didn't have to be at our next destination until the evening which left us most of the day to see the last few things on our list we hadn't gotten around to earlier. One major facet of LA we hadn't fully experienced was the huge influence of the Mexican community. This can be felt in the food and culture all around Los Angeles and Southern California but is probably best experienced in East Los Angeles, which at 97% has the highest percentage of Latino residents of any city in the US. Our first destination on Monday morning was El Mercadito de Los Angeles. El Mercadito is technically in the Los Angeles neighborhood of Boyle Heights, a block away from the edge of East LA, but we might as well have been in the middle of Mexico. It was a typical, smallish market with an emphasis on clothing, souvenirs, restaurants and sundries rather than produce. The first thing I went for was a bag of peeled purple cactus fruit, which the Mexicans call "tuna". It's not for everybody, since it's messy and the seeds are hard to crunch, but I find it delicious with lime juice and fun to eat. The kids clustered around for some bites as well although they quickly got bored with it. On the second floor of the market were the small restaurants along with the more upscale clothing stores. We hadn't eaten much Mexican food yet on the trip, so we gorged ourselves on our usual favorites of menudo, caldo de res, and enchiladas for the kids. The place had a fairly local, authentic atmosphere. Maybe it's different on the weekends, but there didn't seem to be much traffic from the Anglo side of town. The third floor had larger, more elaborate restaurants that were closed at that early hour. On the ground floor we browsed the souvenirs and bought a Spanish picture game for the kids, hoping it might inspire them to learn some vocabulary. The only other place that seemed to be worth seeing in the area was Mariachi Plaza, also in Boyle Heights. Mariachi bands have typically congregated in this colorful square awaiting customers to whisk them off to a wedding or quinceañera. We didn't see any mariachis, so Cleo and I jumped out for a couple of minutes to take some pictures of the colorful storefronts and murals in the square. So far we'd experienced a lot of pleasant surprises in Los Angeles. For one, the food had been a lot better and more diverse than we'd anticipated. Another was that despite LA's reputation for urban sprawl, there's a lot of ways to experience natural beauty within the city limits. Griffith Park, the Venice Canals, and Mulholland Drive had been revelations. There was still another famous outdoor space for us to experience, the Huntington Library and Gardens in the upscale suburb of San Marino, near Pasadena. I've always enjoyed the visual aesthetic of botanical gardens and do my best to get them on our schedule when possible. It's also a good opportunity for the kids to stretch their legs and blow off some energy in the middle of the day. It was an easy decision to ignore the library and art galleries that are associated with the gardens, given the limited time we had and the natural boisterousness of the kids. Nevertheless, we didn't make much of a dent in the extensive grounds. My biggest regret is not having pushed a little harder to make it to the Chinese and Japanese gardens. Unfortunately we got off track and found ourselves in the Conservatory and then the Children's Garden. By the time the kids had finished interacting with all the exhibits in the Conservatory and playing in the Children's Garden, which was exceptionally beautiful, we were all exhausted and ready to move on. The kids immediately fell asleep once we got back to the car and we set off southward to Oceanside, where we'd be spending New Year's with a friend of Mei Ling's. There was one final stop to make in Los Angeles. 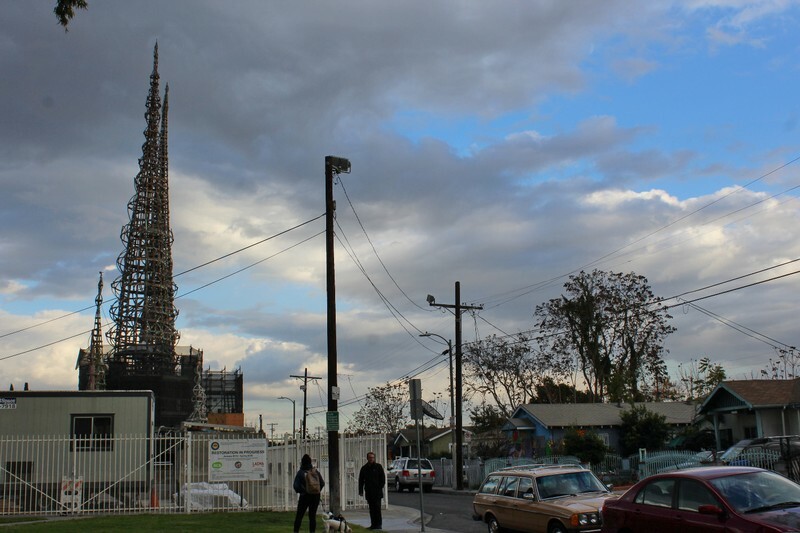 The Watts Towers has a lot in common with quixotic one-man projects we've encountered all over the world. Its builder, Sabato Rodia, was an eccentric Italian loner much like Filippo Bentivegna, who was the creative force behind Il Castello Incantato in Sicily. He built the tower supports and walls from concrete embedded with seashells and fragments of ceramic much like Father Mathias Wernerus did with the Dickeyville Grotto in Wisconsin. The texture of the embedded walls reminded me of Miami's own Coral Castle, also built by a single mysterious sculptor. The metal towers themselves were reminiscent of Dr. Evermor's Forevertron, also in Wisconsin. What force was running through all these men, living in different parts of the world at different times, that drove them to slave at these impractical projects for most of their lives? 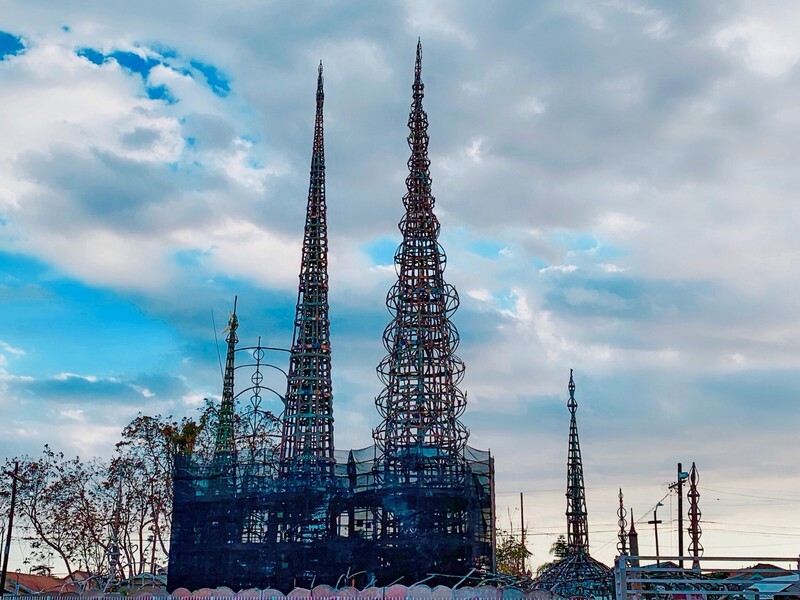 The Watts Towers are only accessible by guided tour and these are not offered on Mondays, so I could only stand outside the metal gates and inspect the sculpture from a distance. Fortunately there were a series of plaques to provide information about Rodia and his creative process. The houses across from the towers are painted in bright colors, in contrast to the drab appearance of the surrounding neighborhood. One was decorated in an especially pretty floral motif. There's also an Arts Center next to the towers that manages the tours and hosts exhibitions. It had taken five days of solid work, but we had crossed off practically everything on our list of planned activities in Los Angeles. However, a lot of those are things like food halls and markets that one can do again and again. I'm confident that when we return to LA in the not-so-distant future we'll be just as busy and enthralled as we were on this occasion. I don't usually devote more than a couple of posts to one city, and I've certainly never done five before. I even put my most recent Europe blog on pause to write up Los Angeles while the experience was still fresh in my mind. Now that I'm done, I still don't feel that I've managed to do justice to this amazing city. Therefore, I made a list of the top ten things we loved about LA to complement the descriptions of what we did there. Architecture: Los Angeles has plenty of famous and uniquely-designed buildings such as Walt Disney Concert Hall and The Broad, but honestly we didn’t get around to seeing most of them. What we enjoyed the most were the gleaming skyscrapers around Bunker Hill and all the neighborhoods filled with classically-styled mansions to admire. Driving around LA was far from the nightmarish experience we were warned about, thanks in large part to the interesting houses and buildings that seemed to be everywhere. Street art. Covering the side of a building in paint used to be done by hoodlums in the thick of night. Now an urban neighborhood seems incomplete when there aren’t any murals adorning the walls of apartment buildings or warehouses. Yesterday’s subversive nuisance has become one of today’s foremost methods of artistic expression. Art on the streets conveys a sense of freedom and insouciance that energizes the neighborhood and creates a sense of community. LA’s street art was ubiquitous, colorful, and dramatic in a way we haven’t seen since Valencia, Spain. Eclectic. Too many American cities have stood by passively as soulless chain restaurants and brand name stores have absorbed all the available retail space in their communities. Starbucks, Dunkin Donuts, McDonalds, and Pizza Huts have virtually eliminated competition from individually owned businesses and undiscriminating consumers have been complicit. In my adopted hometown of Miami locally-owned pizzerias, burger joints, and donut shops are practically nonexistent. In Los Angeles, I was amazed by the number of neighborhoods we drove through that seemed to be devoid of fast food chains and other familiar national outlets. Ethnic culture. New York City is the benchmark by which we measure the ethnic flavor of American cities, and Los Angeles is the first that might actually give NYC a run for its money. When it comes to East Asian culture, LA wins hands down. 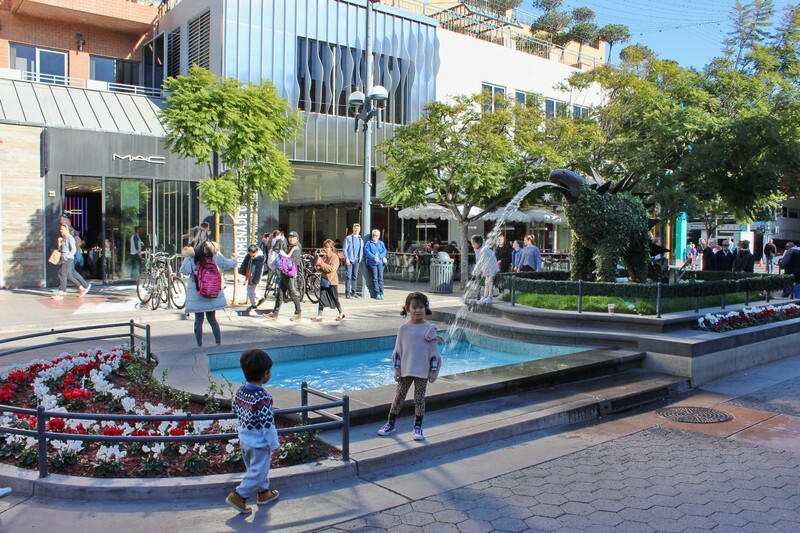 Koreatown, Filipinotown, Little Tokyo, Little Saigon, Thai Town … what else is left? Chinatown is the only weak link in this formidable array of authentic Asian neighborhoods. LA’s got the most pervasive Mexican influence as well, not just in East LA but throughout the city. The best part is that most of the ethnic communities are central and everyone seems to mix fluidly. Downtown. Every major American city has a downtown, and most of them are wastelands with little to explore especially after dark. Downtown LA has no shortage of blight and derelicts, but the dominant flavor here is creativity and energy. Food halls, the Angel Flight, street art, the Toy District, and The Last Bookstore are just a few elements of a truly unique and entertaining part of the city. The suburbs. In most cities, these are pleasant but bland zones whose main purpose is to house middle class people and provide them with non-threatening dining and entertainment options. Around Los Angeles, the neighboring communities have their own bragging rights. Santa Monica, Pasadena, and East Los Angeles would never be mistaken for Anytown, USA. And those are just the ones we were able to visit in five days. Who knows what we would have found in Malibu or Long Beach? Topography. There’s no shortage of urban sprawl in LA, but there’s also plenty of parks and other green space. Then you’ve got the mighty Pacific ocean, the stunning Venice Canals, and the winding, undulating hills and canyons in the north of the city. I still haven’t been able to think of another major American city where you can look out over downtown they way you can from Griffith Observatory or Mulholland Drive. Farmers markets. We’ve been to other cities which punched above their weight in markets. Portland, Oregon is a perfect example. But we’ve never been anywhere that had as many big markets dominated by real farmers as LA. The best markets had their own vibe depending on the part of the city they were in and the time of day they were held. If Miami just had one farmers market nearly as good as South Pasadena or Santa Monica, I’d consider it a better place to live. Food halls. This is a rapidly changing landscape, but I’d be amazed if Los Angeles isn’t the king of the hill right now. Grand Central Market and The Original Farmers Market are the two best food halls we’ve been to in the US, and it isn’t close. Squaremixx and Corporation are awesome on a smaller scale and there’s at least half a dozen we didn’t have a chance to try. The people. Angelenos don’t enjoy a particularly good rep around the country, but our experience was the opposite. We didn’t find people to be vain, shallow, stoned, or particularly irate on the roads. On the contrary, the people we encountered during our five days were some of the most friendly and authentic we’ve met over the course of our American travels. People at the farmers markets and food halls were especially upbeat, and not in an artificial or servile way. I think most people are genuinely happy to live and work in LA, and it shows in the way they interact with others.